Dubai: He has hoisted 24 national flags on his villa in Al Warqa'a and intends to distribute food and financial aid to the underprivileged families in his neighbourhood mosque because he feels he needs to give back to his motherland that has given him so much. For Emirati Gulam Mohammad Al Hosani, the occasion of National Day is an occasion to reciprocate the love his country has showered on him. 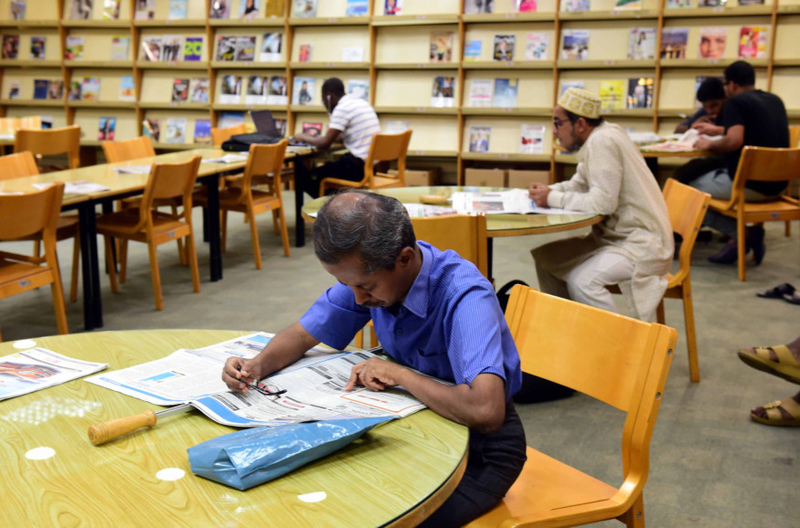 The oldest serving employee at the Al Ras Public Library, Al Hosani, 55, has completed 42 years in his job and intends to work at least until he celebrates a golden jubilee. Starting work at the age of 14, Al Hosani began as a cleaner at the library and through sheer perseverance and determination, rose to assume a supervisory role. “It was 1976 when I joined the library as a cleaner,” recalled Al Hosani. “Everything I have, I owe to my country and this library, “ he added. Reminiscing the early days, he says life was an every day struggle: “We were so poor that I had to start work part-time as a student to support my family,” said Al Hosani, who lost his father as an infant and wanted to help his mother support the family of five children. A firm believer in the value of hard work, he said that will and determination help an individual succeed no matter the circumstances. The principles espoused by Shaikh Zayed Bin Sultan Al Nahyan and the UAE Rulers, he believes, have enabled the UAE to emerge as one of the most dynamic nations in the world. “In my case, having access to quality books changed my fortune. The library was my second home. Everything I know is due to the books I had access to. They provided answers to all my questions and opened the world to me. The staff members were always kind and helped me with my studies so I was able to complete high school. From an ordinary cleaner, I have now become the supervisor and am proud of my achievements,” said Al Hosani, who is the father of four children. All of them are highly educated and one of them is planning to pursue his Masters in IT management in the UK soon, he said. He has fond memories of the old library, before it underwent renovation. “We had two slightly bigger rooms which had many windows all around and were fitted with window air-conditioners. Later, the library got central cooling and the structure was extended to accommodate the growing requirements of residents. Today, it has two reading halls, a children’s section, an internet and CD section besides the binding section and back offices. Earlier, in the summers, we would screen documentaries for students in one of the halls. Many schoolchildren would come to watch them. In the courtyard at the rear of the building, we would hold drama rehearsals for children. The library was such a lively place even then. I cannot think of being anywhere else and would love to complete at least 50 years in my job,” said Al Hosani, who no longer lives in Bur Dubai nor takes an abra to work, but drives from Al Warqa to report at 8am. Immensely proud of his nation and his people, Al Hosani said, “My country has provided me with dignity, self-confidence, pride and self-worth. My four children are highly educated. I was able to provide them with a better life because of the opportunities my country gave me. I salute the martyrs who laid down their lives for the country and its principles.